The upsurge in agricultural food demand due to population explosion and urbanization has great impact on the quality of soil. Therefore, the present study was aimed to assess the contamination and pollution by selected metals (Ca, Cd, Co, Cr, Cu, Fe, K, Li, Mg, Mn, Na, Ni, Pb and Zn) in the soil of typical rural and urban farmlands. The metal contents were quantified by atomic absorption spectrometry employing wet acid digestion methodology. In addition, physicochemical parameters (pH, redox potential, EC, TDS, organic matter, moisture, density, porosity and total alkalinity), anion levels (sulphate, chloride, nitrate and nitrite) and soil texture was also evaluated. Average concentrations of Co, Na, Ni, Pb and Zn were significantly higher in the rural soil, while Ca, Cu and Mg contents were considerably higher in the urban soil (p < 0.05). The correlation study revealed significantly divergent association among the metals in both categories of soil samples. Soil texture mostly revealed sandy loam nature of the soil with higher clay and silt contents in urban soil and elevated sand contents in rural soil which was predominantly Ca–Mg–HCO3 in composition. Significant anthropogenic contribution was shown by the cluster analysis while enrichment factors and contamination factors revealed severe to very high enrichment and moderate contamination of Cd and Pb in the soil. 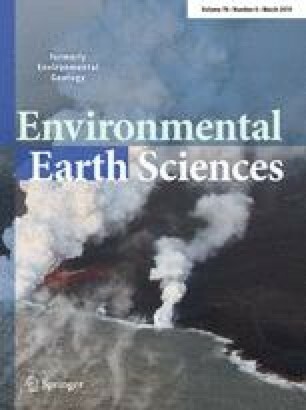 The study showed that elevated levels and anthropogenic enrichment of the metals in agricultural soil could pose serious health risks which should be addressed by appropriate management and sustainable agricultural practices. The online version of this article ( https://doi.org/10.1007/s12665-019-8198-z) contains supplementary material, which is available to authorized users. Financial and technical help provided by Quaid-i-Azam University, Islamabad, Pakistan to carry out this project is thankfully acknowledged. There is no conflict of interests towards the publication of this research paper.